Gen Ittetsu started to learn violin at the age of 6 under his father'sdirection. He made his debut with CBS/SonyRecords as a member of "G-CLEF" in 1989. Released 10 albums (including their "Best of" album) and 2 music videos. He graduated from Tokyo National University of Fine Arts and Music in 1991. Gen Ittetsu went solo and released "Soshina" under BMG/Victor. While at the same time, he began working as a studio musician in 1995. 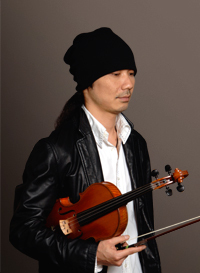 As a solo player and also as the leader of the string section "Gen Ittetsu Strings," he supports various artists' recordings, concerts, and performances on TV. He also records soundtracks for film and television, commercials, and video games. He is also in high-demand as an arranger and a producer.